This is a kind of follow-up from this post which you may want to read first to give you some context. A few weeks later, it was time to go back to be with family and share in the funeral service for my cousin Gary whose stay in hospice was mercifully short but marked with wonderful care. I ended up needing an emergency root canal before we could travel and had to wait for the endodontist to return from his vacation, but God was gracious and the timing worked out well and so the kids and I were able to travel home as planned with Shane coming later on the weekend. While Gary's family took some time to prepare the details for the memorial service on the coming Saturday, my parents' home became the place to be if you were six and under. Laura played all day with her two little girl cousins, inside and out from one idea to the next; they certainly enjoyed themselves. The other little one needed more attention which we were all happy to give. Having someone little to cuddle and feed was a wonderful antidote to the reason for all of us gathering. By Friday, the house was full of arriving family, all of Gary's siblings, his parents and extended family who had different timelines for the last time everyone had seen everyone. Pleasant times, little people, new additions and catching up on family news made for many clusters of conversations and diversions. And amidst the funeral arrangements, Gary's wife, Donna marked another birthday which we all helped her celebrate by going out for dinner at a local restaurant with her parents and brother arriving in time to join us. It was a full crowd of friends, cousins, grandparents, nieces and nephews, aunts and uncles, brothers, sisters, parents, grandchildren and great-grandchildren. Hugs and handshakes, tears glistening, laughter breaking out, the coming together joyful yet marked with sorrow. My cousin Gary was a Baptist pastor and loved to sing hymns and his children, Rachel and Jason are both very musical, both in playing instruments and singing. Jason played and sang at his Dad's funeral service and I believe that Rachel and Jason sang together at a memorial service held on Sunday afternoon which I did not attend. It was a short time to be together as family, but as Christians, our hope is in the forever we will have with all of God's family. And while these next two photos have nothing to do with the family gathering, they were part of this trip so I'm including it here. A year or so ago, I saw these kilns on some social media page and was astounded to learn that they were in a small park in my hometown area. I had never heard of them and mildly rebuked myself for not being very good at my friend Gerda calls, 'a tourist in your own city'. So I decided to search them out with my first chance being this past February. I knew generally where they were and thought I would find them by just driving in the area, or as it actually was, Shane driving following my guesses at what direction to go. We didn't find them and I went home perplexed, but determined. At some point between our February trip and our March trip, my mom mentioned in an email that she had found them(!) by following some obscure sign off a familiar road. They were in a small park that was part of a biking/walking trail system that winds around much of that area. In fact, the quarry trail that we walked back in February is part of that same trail, just at opposite ends of each other. Based on her directions, coming from a different way, I set out to find them after finishing some shopping one afternoon. I do not have data for our phone, so looking them up while out and about is not possible, but it made the hunt more interesting. I retraced the way Shane and I had traveled, but made the correct turn where before I had mistakenly chose the wrong way and then suddenly in an unexpected valley there they were. The kilns were originally inside a large building and were used to make a type of cement which this area became known for. The kilns are in the process of being refurbished as the brickwork was crumbling and falling into disrepair. I was not alone in the park, many casual bikers and walkers were using the trail, stopping to admire the view and take a drink of water on that warm day. It was nice to see that this bit of local history was being appreciated and restored for others to learn about. water in our kitchen floor as I was attempting to clean it up and twisted my left knee as I fell. The full extent of the damage is only partially known, with a stretched ligament, hamstring injury and unknown damage to inside of kneecap. The swelling very gradually is going down and I have been in physio therapy sessions multiple times a week for the past four weeks. I have seen an increased range of mobility, even going up steps at my old pace on the good days. Bending my knees to look for things in the fridge, in the lower cupboards, and any sort of kneeling are still not happening. I have been put on the list to have an MRI to see what damage was done, if any, to the meniscus. Whether I have that done remains to be seen. The injury certainly has been a disruption to our regular routine, but Shane and the kids have been very helpful in doing the tasks that I found too difficult. Early on, my therapist suggested an adjustable cane for managing the limp, it was humbling to have to purchase one and use it as I went from the house to the parking lot and even to church. Also getting another year older only a few short weeks later made me feel old and decrepit. Friends celebrated my birthday with a delicious homemade chocolate hazelnut cake and thoughtful gifts and flowers. The signage was lovely and the decor consisted of pine branches and Dash the rooster's best tail feathers. Perfect for this group of friends. We celebrated again with Shane and my mom with pizza and a version of angel food cake that is my traditional birthday cake. Later in the weekend, we celebrated again with my brother and sister-in-law and were treated to Chinese food and ice cream cake. I still do feel old, but hoping with the return of spring, I can feel the rejuvenation that is going on around us. The injury could have been much worse, and between my mother coming for a week and friends bringing some meals over and encouragement from friends, I have known the Lord's kindness in my frailty. Kate likes to re-enact my injury by going down on one knee and then lowering her head to the floor and gently tapping it on the floor as if to show that I even banged my head, which I didn't. I landed sorely on my bottom. Lots of padding there. I missed being able to go with Seth and Laura to the annual Lego contest held at a local aviation museum. But they went with friends and showed off their original flying machines to the judges and the participants. Neither won anything, but their friends made clean sweep of the prizes and they all enjoyed their time. Laura later was inspired to build other things with Lego, when she wasn't busy running her 'doctor's clinic', having indoor picnics, flying her homemade kite outside or playing with her Calico Critters, just to name a few projects she has gotten into. 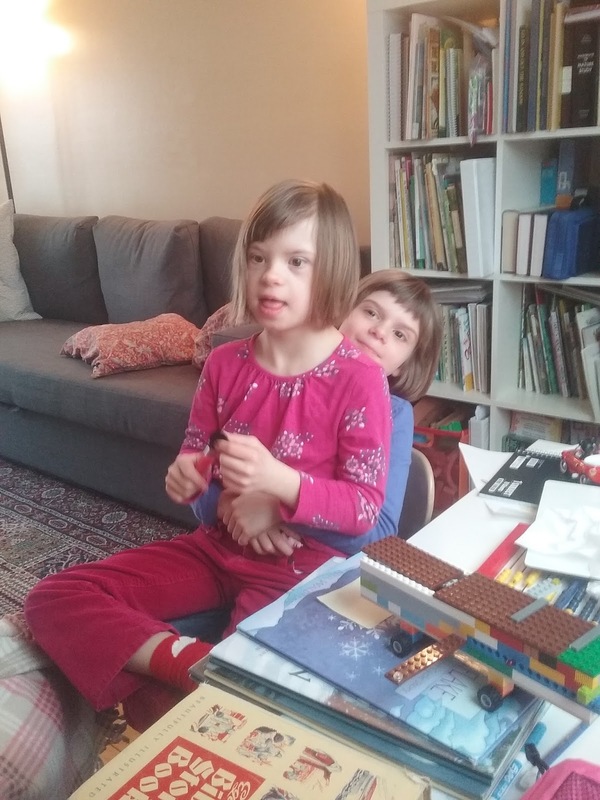 Her enthusiasm for play turned many cold wintry days into enchantment, even if we are out of tape and a little bit of patience for all the projects that threaten to overwhelm our living space. I take photos of many of them to save the memories before they are ushered back to the recycling bin or garbage. She shows much promise for ingenuity and design, I look forward to seeing what she produces as she matures. In the meantime, I have to buy more tape. Our swallowtail butterfly did well for several weeks drinking the sugared water I provided in small plastic caps, even when we had to travel. But one day it became apparent that life was becoming more of a struggle, so we turned it into a specimen, preserved forever. Our growing church needed a new meeting place, so an Anglican turned Orthodox church building is where we have been meeting while we wait to know for sure what is available long term. My friend, Katie and I share teaching responsibilities for the six-seven year olds which includes some our own kids. We have class before the Morning worship time, so we don't have to miss anything. The snow we had is all melted and the river flooding has mostly subsided. Green is the currency of spring and we will take all of it in its varying hues and textures. I brought back some bricks and boards from my dad's outdoor stash to make a bit of shelving for my newly minted desk area. I didn't remove any of the moss or dirt from the bricks or boards, just set up everything as is and started adding the pieces scattered around the desk. I just need to dig out the desk from the multiple stacks of books that have accumulated over recent weeks to get my work area back now that I can bend my knee to sit there.